The Watauga County Board of Education recognized a number of students and teachers at its board meeting on Monday. The school board also welcomed new Watauga High School Principal Dr. Chris Blanton. See the photos below. Middle and high school orchestra, band and chorus student participants of state level competitions were recognized by the board. Teachers renewing National Board Certifications were recognized by WCS Chief Academic Officer Tamara Stamey. Sue Wells EC PreK, Natalie Willis AIG Parkway, Dacia Trethewey- WHS Arts, Rachel Willingham-WHS Math, Ann Miller-Reading Specialist Bethel, Shelly Campbell-Reading Specialist Parkway, Kim Bentley- Reading Specialist Green Valley, Barbara Myers-3rd Grade Hardin Park, Shannon Stanberry-2nd Grade Green Valley, Christy Laws-Middle School Cove Creek and LeAnne Hildebran-Middle School Green Valley, were recognized. 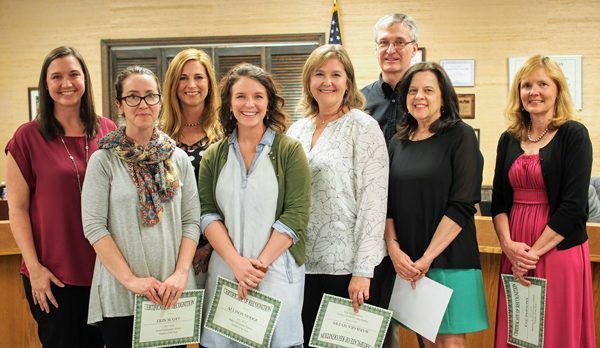 Watauga County Schools Teachers of the Year were honored by the board. The group will go on to a banquet in their honor in early May. Pictured are: Erin Scott from Bethel, Eve Parson from Blowing Rock, Stephanie Kostis from Cove Creek, Barbara Myers from Hardin Park, Allison Hodge from Mabel, Robin Smith from Parkway, Debbie Glover from Valle Crucis and Derrick Jones from Watauga High School. The Price-Deverick Scholarship was presented to Megan Turner, Brooke Huffman and Sandra Ruppert by Watauga Education Foundation member Wendy Jessen. Superintendent Dr. Scott Elliott presented the April Servant’s Heart Award to Watauga County Schools Head Nurse to Shelly Klutz. Elliott commended Nurse Klutz’s dedication to her role and to the safety and well-being of students at Watauga High School. Elliott said that Nurse Klutz was a consummate professional who served as an able and quick first responder to any incident at WHS. Dr. Chris Blanton was appointed by the board to become the new principal at Watauga High School. Blanton is joined by his family and Superintendent Dr. Scott Elliott.